File image of Gatwick Airport. On the Wednesday and Thursday before Christmas, the UK’s second busiest airport, London Gatwick, was completely closed after one or more drones of what UK aviation minister Liz Sugg called “industrial specification” were flown in critical flightpaths and over the airport. The situation appears to be substantially more serious than an amateur drone user not paying attention to instructions, with reports of multiple UAVs, disruption spread over two days, and with the operator or operators seemingly moving frequently to evade detection and capture by authorities. “There is significant disruption, as a result of what appears to be a deliberate attempt to disrupt flights,” the airport said in a statement. Airport information suggests that over 110,000 passengers were due to fly on some 760 flights on Thursday, in addition to to the 10,000 passengers whose flights were disrupted on Wednesday. “Following reports of two drones flying over the Gatwick Airport airfield at around 9pm [on Wednesday 19th December] the airfield was closed from 21:03 Wednesday 19th December to 03:01 Thursday 20th December,” the airport noted. Local law enforcement, Sussex Police, played down suggestions of terrorism. “There are no indications to suggest this is terror-related,” said the force in a statement. VIDEO – This BBC News report investigates how drones can affect airport operations. 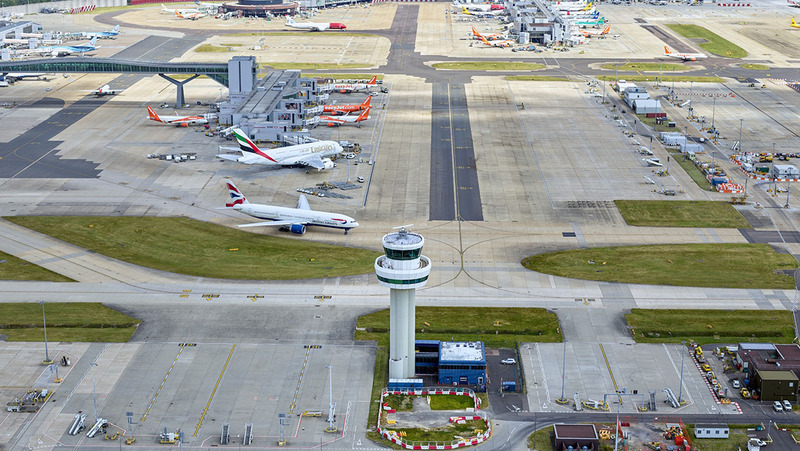 As with other UK airports, Gatwick has been hit by protests against expansion, driven largely by local noise and ground congestion complaints and concerns about the impact of aviation on the wider ecology, including its contributions to climate change. “This is a crime. This drone is being flown illegally. Earlier this year we changed the law to make it illegal to fly within a kilometre of an airport,” minister Sugg stated on UK television. Gatwick, more than half the size of Heathrow in passenger number terms, saw chaos overnight Wednesday and through Thursday as passengers were urged not to travel to the airport. Flights from Europe and further afield were diverted across the continent, with scenes of passengers stuck far from their destinations and within Gatwick’s terminals a clear example of the dangers that even small UAVs can pose to commercial aviation. The UK aviation regulator, the CAA, suggested that passengers affected by the situation should not expect the usual levels of disruption payments. It’s unclear whether Gatwick and the airlines that operate to and from the airport would have the capacity, four days before Christmas, to reaccommodate a full day of disrupted passengers. Condemnation of the status quo was strong and immediate on Thursday, with stakeholders from across the aviation industry calling for stronger regulation of drones. ERA, the European Regions Airline Association, many of whose members are heavy users of Gatwick, issued a strong statement in response to the situation. The UK law on drones was most recently updated on July 30 2018, making it illegal to operate a drone above 120m (400’), within 1km of an airport or airfield boundary, within 50m (150ft) of people or properties, or 150m (500ft) of crowds and built-up areas. The law also made endangering an aircraft with a drone a criminal offence subject to prosecution and a potential prison sentence of five years.